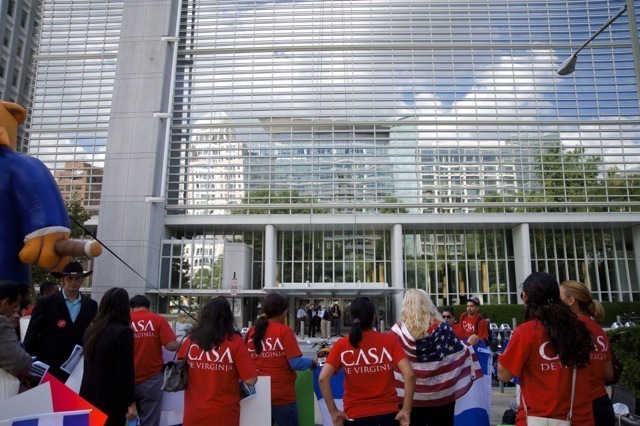 Salvadoran communities living in the DC area celebrated the 193rd anniversary of independence of El Salvador in front of the World Bank on Monday. Why did they decide to forego their Monday obligations and gather in downtown DC? Because behind closed doors, inside the World Bank’s International Centre for the Settlement of Investment Disputes, a three-member Tribunal is currently deciding whether the Salvadoran government should pay more than $300 million dollars to a multinational mining company called OceanaGold (formerly Pacific Rim). This company is trying to operate a gold mine in the northern region of Cabañas, despite the fact that both the Salvadoran people and the government have said “NO” to mining there. Salvadorans do not see mining as a key to solving the country’s poverty and inequality issues, and there are grave environmental concerns about the mine. 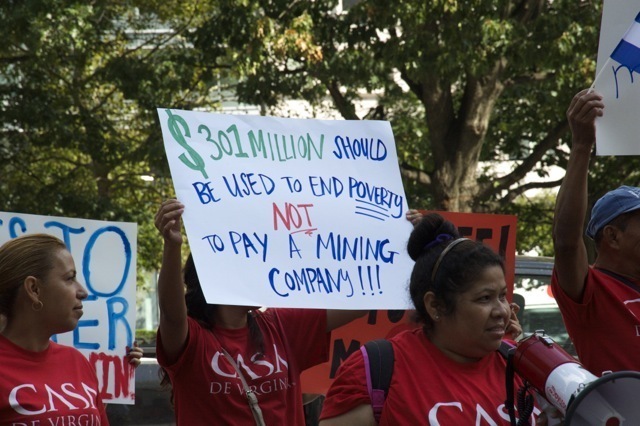 “301 million should be used to end poverty, not to pay a mining company.” (photo). 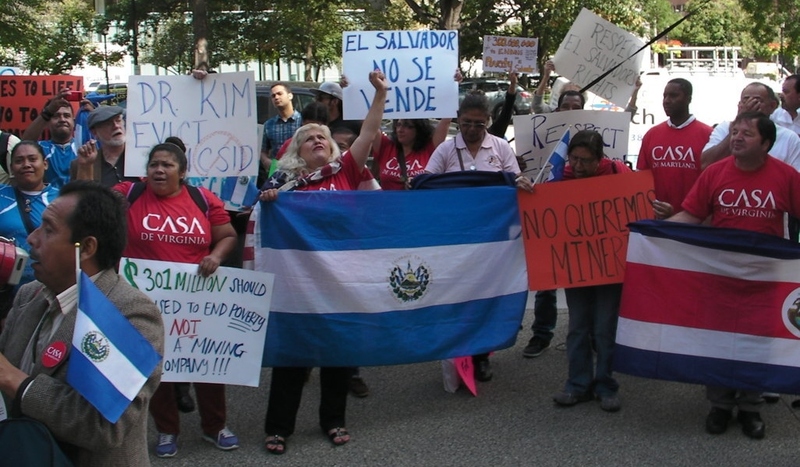 The Salvadorans standing up to the mining company were not alone. Casa de Maryland and Casa de Virgina, San Camilo [Saint Camillus] Parish, Oxfam and a multitude of human rights and environmental NGOs were there to support the right of Salvadorans to a real independence from corporate and private powers that are causing strife in their country. 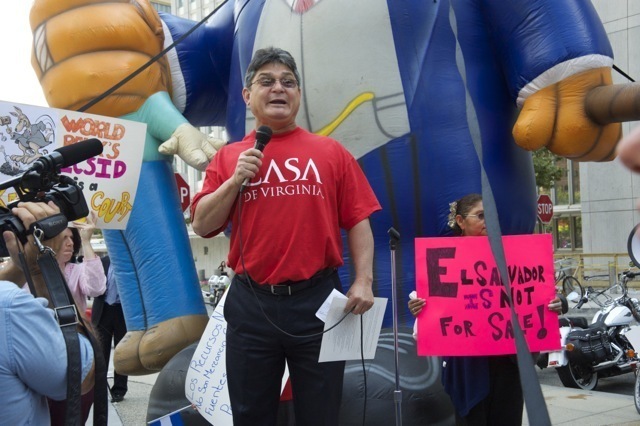 OceanaGold’s suit against El Salvador in the World Bank throws the supposed “good faith” of their corporate social responsibility policies into question. Besides the outcome of this legal – and non-transparent – battle (the outcome of which is to be made public in the spring of 2015), there are more important questions to continue asking OceanaGold/Pacific Rim: Are you listening to the Salvadorans? Do you really want to impose your business on top of a sovereign decision? Have you assessed the risks, both for your business and the economy, and more importantly, for the people in El Salvador? How do you reconcile this behavior with your commitment to “Free, Prior and Informed Consent”? 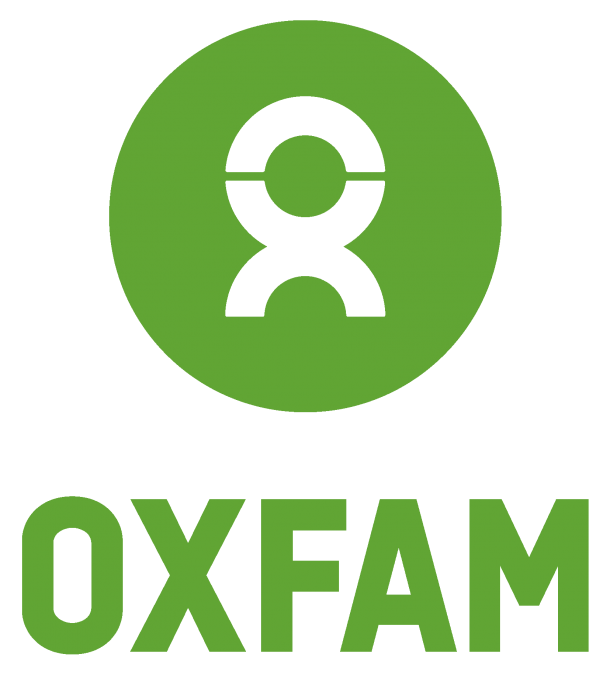 And now another question for the World Bank: Will its tribunal respect human rights over the interests of privately-held, multimillion dollar companies? 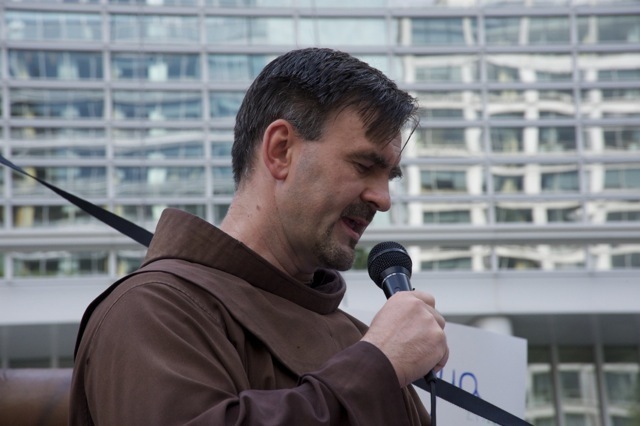 He told the crowd gathered that Pope Francis has decried “an impersonal economy that lacks a truly human purpose [and which] tends to devour everything that stands in the way of increased profits, whatever is fragile, like the environment.” It is a contemporary version of the worship of the ancient golden calf, he said. You can keep supporting Salvadorans by joining 167,000 voices asking OceanaGold/Pacific Rim to drop the lawsuit against El Salvador by signing this petition. Read more on the OceanaGold/Pacific Rim case here.